INAUGURATION CLOWN GALLERY - THE OPERA PAINTED WITH FOOD BY DANIELE CELLINI The only Italian artist who uses food with the technique of Action Painting Sunday, July 5th, 2015 there will be the inauguration of CLOWN GALLERY: a collection of paintings by various artists depicting the CLOWN. The main theme of EXPO MILANO 2015 is food and the fight against the waste of food. Among the artists there is also DANIELE CELLINI, painter who recovers the leftover food and creates paintings with a special technique, giving a final use to organic materials that would otherwise be discarded. Against the waste of food in the world Daniele Cellini presents at CLOWN GALLERY 2015. 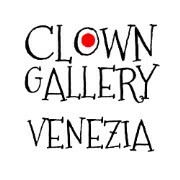 The Clown Gallery is an exhibition of contemporary art (mainly painting) that contains within it a different number and type of artists, including local venetians artists but also famous Italian and foreign musicians, which hobby is painting, or that have a special passion for painting. Each of them will represent the subject of CLOWN with their technique. Present the Country ROMANIA with the Artist LUISA POPA Association "Romanians and Moldovans in Veneto". AIMS : The Clown Project Gallery is aimed at giving a continuous space entirely dedicated to the figure of the clown. Annually it will be represented by a variety of art forms to accepting if always new artists to create diversity with the same subject: the CLOWN. Clown more classic to the more scary the artists are free to make it through his vision and technique. All this is also a fundraiser for the Association Parent Project (Italian Association for Research on Duchenne Muscular Dystrophy and Becker - rare diseases). The works are for sale and the entire proceeds will be donated to Parent Project. Visit www.parentproject.it. DURATION: July 2015; project lasting four weeks; periodicity: annual. FREE ENTRY ONLY on INVITATION, for booking call 342.6968991. All 4 weeks of exposure at Exhibition Hall Hotel Amadeus is FREE ENTRY. LOCATION: c / o Exhibition Hall Hotel Amadeus, Rio Held - Lesta De Spain, Cannaregio 227, 30121 Venice. Sunday, July 5th, 2015 Inauguration of CLOWN GALLERY: a collection of paintings by various artists depicting the CLOWN. Among these painters there is also Daniele Cellini using FOOD by garbage, Ricky Bizarre of Radiohead and the radio speaker PIZZA Graziano De Santis of Radio 105. Daniele “Celly” Cellini was born in Mestre (Venice) in January, 1977. Now chemistry graduate and insurance broker, in his childhood he began to be fond of drawing and graphics, landscapes and portraits first, which later evolved in people stylisation and trait spoofing. Celly started his art path in 2012 in Venice as a self-taught acrylic painter. His paintings are the result of physical action and personality expression: lively, imaginative, riveting features represented by evocative red color and fueled by hard rock and heavy metal music. Red color use is a tribute to the millennial art history of Venice. from past to actual times. His innovative and original technique consists of throwing color-soaked food waste on canvas. The contrasting bright colors convey freed emotions and feelings, and help the observer understand the artist's multifaceted personality.